Precious Purl: Yarn, Knit, Yarn, Knit, and some Crochet thrown in! Yarn, Knit, Yarn, Knit, and some Crochet thrown in! Lots of Yarny business at Precious Purl this last week! 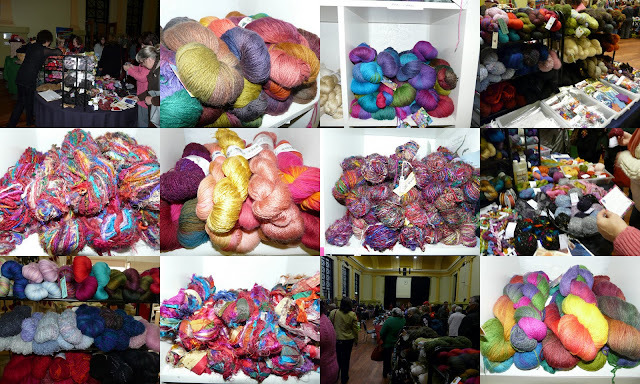 We were at the Handknitter's Guild Yarn and Craft Market at the Brunswick Town Hall yesterday. I'm sorry if you missed all this gorgeous yarn in one place, as it only happens once a year! Thank you to all the lovely people who visited our stand, we were hard to miss right next to the entrance. If you did miss out, you will just have to visit us in Fitzroy or come to the Bendigo Wool and Sheep show, the next big highlight on the Yarn Lover's calendar. July 15th - 17th at the Bendigo Show Grounds is an event not to be missed. Stay tuned for more workshop details, coming soon!